In August 2016 a new bee-fly was confirmed in Britain, when Rob Mills photographed it in his Cambridgeshire garden. 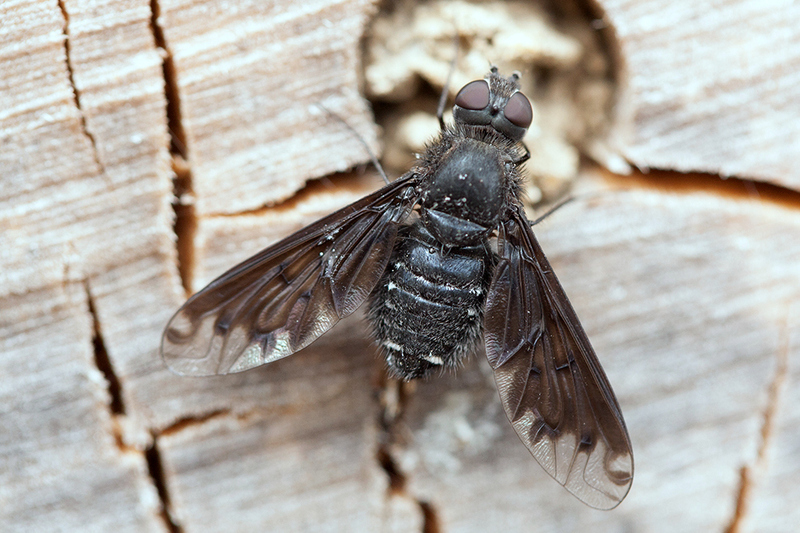 It has been given the names Black Bee-fly or Anthracite Bee-fly, and its rather alarming scientific name of Anthrax anthrax derives from the Greek for coal, referring to its colour. Like several of the bee-fly family, this distinctive species lays its eggs in and around solitary bee nests, and the fly's larva takes over the bee nest. The Anthrax bee-fly is particularly associated with mason bees (genus Osmia) and other solitary bees, and on the continent has benefited from the popularity of 'bee hotels', even in urban areas. There are museum specimens of Anthrax anthrax from 1929–1930 that are labelled as being British but are suspected to have originated from the continent. It has not been seen again in Cambridgeshire since Rob's 2016 sighting, but another one was reported by Michael Woods from near Canterbury, East Kent, in June 2018 (see the article in Newsletter 6). If it does establish itself it could become a familiar sight in gardens. We are keen to monitor its spread, and records, preferably with photos, can be added to iRecord. May and June are the peak months for it on the continent, but its flight period can extend into August or even September.